Tiberius, AD 14 to 37, Silver denarius. Date : issued from AD 15 to 37. Size : 17.6 x 19.0 mm. Weight : 3.71 grams. Grade : VF but with full inscriptions on both sides. Obverse : Head of Tiberius right, with TI CAESAR DIVI AVG F AVGVSTVS around. 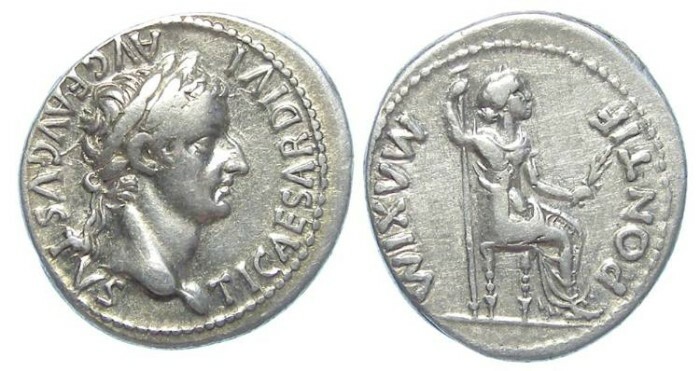 Reverse : Livia seated right holding a sceptre, with PONTIF MAXIM around.